At the end of October, Castle were running a limited offer for two weeks selling DIY kits for an Iyonix. I bought one at the RISC OS South East Show, saving a fair chunk of postage. 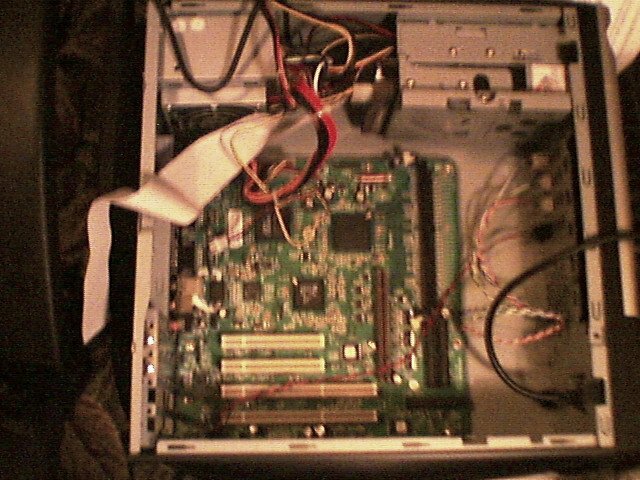 Once I had put it together it became my main machine. I called it dusty , short for Dusty Bin, as it has an IOP321 at its heart. Similar reasons to the Athlon Thunderbird machine being called tracyisland. Both of these trashed my original n naming scheme of mnemonic, numeric, pneumonic and pneumatic. I bought the DIY kit (including fitting information, CD image, motherboard and graphics card (with Red and Blue appropriately switched)), USB card and 1G memory. I also bought a scanner and Sharp LL-171A TFT monitor. If I’d been buying just 512M, I would have sourced the memory myself but Castle said that the 1G was very specific. For information, my 1G RAM claims to be Infineon HYS64D12802GU-7-A with A3531427007 and is 1024MB, DDR, 266 CL2. It is organized in 128Mx64 SDRAM PC2100U-20330-B1. 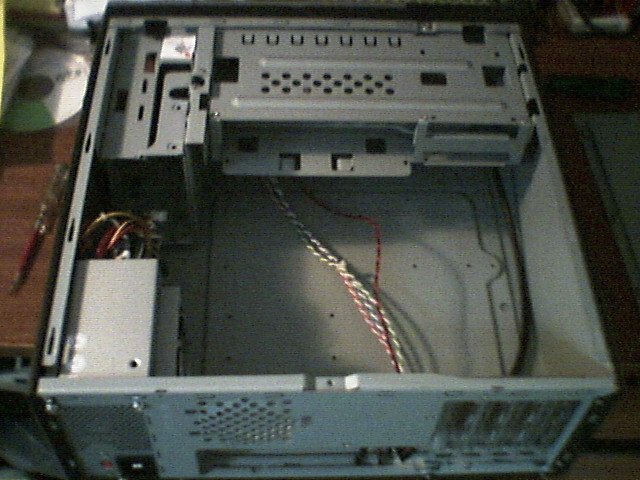 I bought an NEC ND-3500 Double Layer Dual 16x DVD R/RW (awaiting CinoDVD and DVDBurn) £46.72, an Ebuyer USB-PS2 adapter cable (£5.86) and a Casetek CK-1007-2B MicroATX case (£17.61) but needed to add in P&P). I used HardwareZone to figure out how to use the case (and to decide to buy the case in the first place, with a Google search for ‘Casetek Tiny Tower’ ). The hardest part was when I was concentrating on the pictures in the guide above and attempted to put my harddisc in the slide out bit the wrong way around. It almost fitted in but was a pain to get out again so I could put it in the right way. If I had been looking at what I’d been doing, it would have been much more successful. I needed to cut up the cable from the card reader part of the drive so that it fitted on to the remaining pins on the USB2 card. My Leatherman Wave and a Workmate helped here, as did the supplied diagram of the USB card’s connector. My total build cost was £1085.65, saving me a decent amount compared with the cost of a ready-built Iyonix. 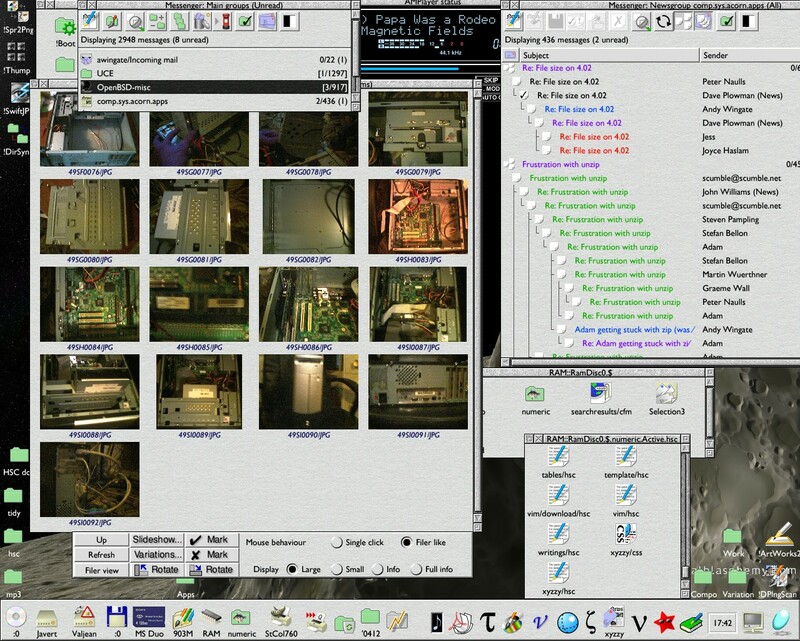 Without the DIY scheme, I certainly would not yet have taken the plunge as my Viewfinder-equipped, Select-running StrongARM RiscPC did everything I needed it to do. Some things were annoyingly slow but I could put up with that. With the Iyonix, Messenger Pro seemed much faster and Messenger Pro 3 has made things even faster. The much faster network card and harddisc interface and greater memory make it much easier to get things done. Even Oregano2 seemed fast to start with. The case has no reset switch and the power switch only seems to want to work to turn on at the moment. This may be (and indeed probably is) my fault. Otherwise it works well. If I need to forcibly reset the machine I pull out the plug, reinsert it and switch it on again. I expect if I open open the case I'll see I have a cable the wrong way round. There is definitely no separate reset button though. The USB-PS2 adaptor works well and I would add it to the Iyonix USB device database except Ebuyer seem not to list it now. The adaptor is an EzKEY Corp Composite USB PS2 Converter and appears very similar to this picture. If you already have an Iyonix and are on the Smartgroups hosted iyonix-support list, then the following search should find all messages about USB and PS2 adaptors. I have various pictures taken via my P800 (and transferred via the card reader) but I built the machine and took the pictures under artificial light on a late afternoon so they are not very clear. I’ll have to figure out if any of them are worth using. Two are below and the rest can be seen in the screenshot. Bare case (74K). Case with board inside (91K). Castle ran the DIY Iyonix scheme again for the Midlands show and it has ended again. I have since bought a Logitech Internet Navigator Multimedia keyboard and a Logitech MX700 cordless optical mouse from JustDeals on eBay to use with HID. The Keyboard came is US layout but I have stuck with the UK keyboard layout for most things as I can ignore the keytops. For when I need it, I easily set up a keypress change between UK and USA keyboard layout using HID. I like the keyboard and am setting up useful shortcuts with the Green key. The new mouse was a bit erratic to start with but now works brilliantly. I’m guessing some condensation got caught inside it from its trip in the cold. Jess Hampshire refers to his as a DIYonix which I hadn’t thought about before (probably as Castle call it the Iyonix pc DIY kit . Neat. 17/xii/2004: Drobe do a piece on Building a DIYonix, featuring Jess and me. 18/v/2005: While testing CDVDBurn, I decided to buy a Lite-On SOHW-1673S (£35) which matches my Iyonix's case better and is properly supported by CDFSSoftATAPI so can also read DVDs directly via CDFS. Unlike the NEC, it also writes OK to DVD-RW with the current beta of CDVDBurn. I have moved the NEC into an external USB2 enclosure so it can be used between the Windows machine and my OpenBSD box. I would therefore recommend the Lite-On drive. I am using MiniDisc to provide my alt-tab-ability although I still prefer the way Thomas Leonard's AltTab worked. I also use AutoFocus and MouseAxess to help get around when mousing. I have also switched to using Memphis3 for my RAM disc and I share it across the network. It is much better now than the old versions running out of the Sprite area that seemed to run really slowly. To the right is a rather staged version of my desktop at 1280x1024. The full size version clocks in at 506K, but the screenshot is also available as low quality JPEG (130K) or highest quality PNG (1320K). I await Select32 for the Iyonix as I had come to enjoy various features of Select on my Risc PC (and also GUS’s Wacky-Talky which I shall have to cope without). I am using ScanLibs from Select to keep my Library directory tidier and I have changed the directory icons back to a RISC OS 4 style. I may take some better photos of my Iyonix with my Canon A95 and put them up here.